Area of work – do you want clinic? If that is your ultimate goal, I suggest you try to apply for a clinical position even if you have no experience, rather than trying to get a job in another area, unless you need it for your budget. Species involved – do you want to go Small Animal only or are you willing to work with horses as well? Working pattern – are you looking for a standard full-time job, a part-time or a locum placement? Rotas – are you willing to do on-call and out-of-hours or do you definitely want a placement without any of that? Once you have an idea about the type of job that you want, start looking for it. Where? Two ways – either search for available vacancies online or through a recruiter or recruitment agency (or similar). Alternatively, if you are looking for locum placements, put up a nice CV with cover letter and send it to local practices where you’d like to work. Having a recruiter or belonging to a platform such as Simply Locums (read below) can be very helpful if you want to work as a locum too (as locum vets have different finances and nice recruitment agencies can help you deal with that). Searching for jobs and applying for jobs are two different things. If you are thinking of applying, make sure you already have at least an appointment with the RCVS. Otherwise, you are unlikely to have a positive reply. There are job advertisements in several platforms, ready for you to select your criteria, click a button and see what’s in the market. As a matter of fact, there are probably TOO many platforms! So in order to keep things easier, I have selected the two that are most used, where you have a huge selection of offers when putting both websites together! When looking at recruitment agencies, make sure you understand the implications of joining them for your future job search. Namely the fact that you are unable to apply independently to the practices that place a vacancy with the recruitment agency and, therefore, you come with a “price tag” on your head when you apply to a vacancy through a recruitment agency. To understand this better, we have a blog post about recruitment agencies. However, not all is bad! Like I said, recruitment agencies might have very specific vacancies and there are so many around that it’s easy for you to contact several of them. Plus, if you have a linkedin profile you can also connect to some recruiters. Having a UK address can be especially handy, as you might be approached by recruiters instead – make sure you connect to other vets, companies and corporate practices, especially in the area you are or want to go to. There are some recruitment agencies you can find in linkedin, such as Vet Recruiters and Vet Jobs Plus. Taking into consideration that recruitment companies charge the practices for sending vets their way, this means that many practices that are advertising on their own too will often overlook candidates coming through the agencies (they literally have to pay to hire them). On this subject, though, there are of course many practices that prefer to work with good recruitment agents – usually vets! If you want to search for a job fairly specific and you’re not happy with what you’ve found so far in the other platforms, there are some more you can consider. The first I would like to introduce you is The Vet Service. You can also check out Simply Locums. Although the name does say Simply “Locums”, the platform works as a job advertisement platform with full-time and part-time offers on top of their locums (*note* you do NOT want a locum role as a first – or even second – role!!!!! You can read about locum vets here and find out why). Simply Locums also works with a different model from the other recruitment agencies, as the practices get charged a flat fee for joining the platform and posting (much like the first two websites, VetRecord Careers and Vet Times Jobs) – except you can have a lot of support and feedback when you go through the Simply Locums platform! Like with The Vet Service, you can also register for free and fill in your profile. The biggest advantage with Simply Locums is that you continue to apply to the vacancies independently, so you are at the same level as any other non-agency candidate. Or maybe a bit more since you can have a lot of help from Ben! 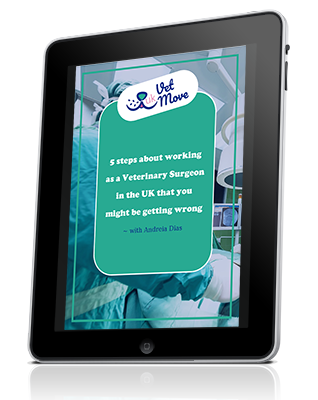 Who is the creator of the platform and also a vet “walking the walk” 🙂 He is particularly knowledgeable about locum vacancies – something for you to consider after you get to grips with working in the UK! There is one final platform for you to consider (although I think two are enough “work”!). It’s called Hunting For Vets and has a similar model to Simply Locums. It’s also free to register (so no harm done in doing so), but I haven’t seen a huge amount of roles available, so it might not be quite as useful as the other platforms even just for “job research”.